LIMOUSIN cattle from the Redland, Hollyash, Redrock, Castlenook and Dyke herds were presented for trading at Carlisle. The Redland dispersal from R.M. and H.J. Lewis, Wetherby, led the way, selling a cow and calf outfit to a high of 15,000gns. Born in November 2011, the cow was Gazelle, which was bred by the French Chatelus herd, where it was successfully shown as a heifer. By Volcain and out of Civelle, it sold with its Eldorado-sired heifer calf, Redland Novality, at foot. Back in-calf to the same bull, it found a new home with Hadfield Wood Recyclers, Droylton. A cow and calf outfit followed at 6,800gns for the pair. The Eldorado daughter Redland Helga was picked up for 3,200gns by Barries Farmers, Biggar, and its Heron-sired bull calf, Redland Merlin, sold for 3,600gns to the same home. September 2012-born, and out of the Goldies Valmet daughter Redland Dimante, Helga was sold back in-calf to Heron. At 5,100gns, P.J. Dales, Ripley, Derbyshire, managed to snap up the stock bull Heron. Bought by the Redland herd from Gaec Lebourg as a calf, this September 2012-born French bull is by Diego Leb and out of Bussy. 30 cows served and/or suckling, £3,237.50; 8 heifers served and/or suckling, £2,205; 10 served heifers, £2,131.50; 10 maiden heifers, £1,506.75; 3 stock bulls, £4,375; 4 young bulls, £3,176.25. A COW and calf pair from the Redrock herd of J.S. and J.O. Dodd, Penrith, reached 10,800gns for the two. Selling for 5,800gns was the April 2014-born cow Redrock Jazzylady, a daughter of Frewstown Fbrilliant which was sold in-calf to Shaws Jimmy, to M.A. Harryman, Pickering. Its bull calf, Redrock Mallard, which is also by Jimmy, made 5,000gns to Gary Bell, Lockerbie. Messrs Jenkinson, Penrith, paid 10,200gns for both the cow, Redrock Jill and its heifer calf Redrock Magic. 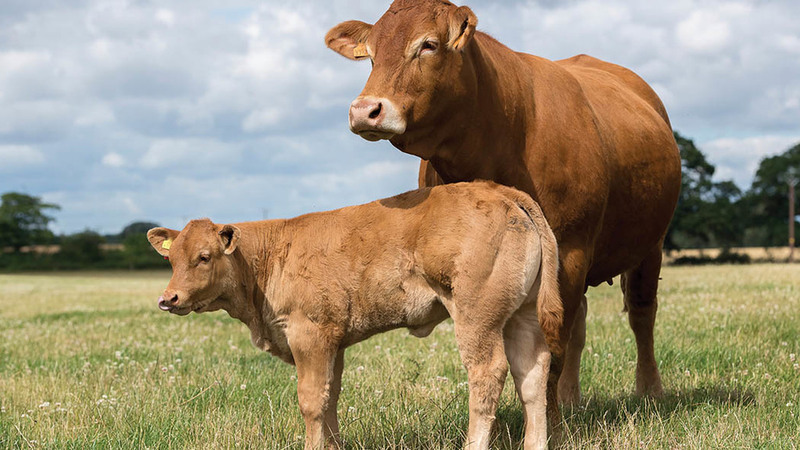 March 2014-born and also by Fbrilliant, Jill was also sold in-calf to Shaws Jimmy for 6,000gns, while the heifer calf, a Japelou daughter, made 4,200gns. The sole stock bull to be auctioned in the Redrock sale was Shaws Jimmy, which realised 7,800gns. By Ampertaine Commander, it was picked up by an undisclosed buyer. 12 cows served and/or suckling, £4,663.73; 4 maiden heifers, £3,202.50; 1 stock bull, £8,190; 1 bull calf, £1,365. THE CASTLENOOK herd of A. Irving, Brampton, hit 5,000gns for a cow and calf pair. The cow Castlenook Imogen, a daughter of Sympa and in-calf to Elite Forever Brill, sold for 2,200gns to J.C. and S. Little, Wigton, while its Rathconville Eugene-sired bull calf, Castlenook Mastermind, sold to R.J. and A.Y. Armstrong, Cockermouth, for 2,800gns. At 4,800gns was Castlenook Hermione and its Elite Forever Bill-sired heifer calf Castlenook Marjorie. Hermione is by Haltcliffe Braveheart and was sold in-calf to Loosebeare Fantastic. The buyer of the outfit was C. Cropper, Long Preston. 12 cows served and/or suckling, £3,053.75; 6 maiden heifers, £1,382.50; 1 bull calf, £1,522.50. BEST of J.R. MacGregor’s Glasgow-based Dyke herd was a cow and calf outfit at 9,000gns. Selling for 3,000gns to D.J. Thomlinson, Carlisle, was the cow Dyke Flower, a March 2010-born by Cappaduff Aaron. At 6,000gns was its bull calf Dyke Mandela, a Dyke Gandalf son which sold to G.D. Pickering, Whitby. A 6,500gns bid was paid in total for the Cappaduff Aaron-sired cow Dyke Gemma and its Goldies Comet daughter Dyke Marilyn. Born in March 2011, Gemma went home with R. and M. Scott, Brampton, for 3,000gns, while Marilyn, a successful show calf, was sold to Messrs Jenkinson for 3,500gns. 20 cows served and/or suckling, £4,381.13. J. and G. Burrough, Whitchurch, of the Hollyash herd took a top bid of 2,700gns for the Carmorn Dauphin-sired cow Hollyash Ida. Born in February 2013, it sold with its Emslies Galileo-sired heifer calf, Hollyash Neta, at foot to N.R. and C.S. Hodgson, Kirkby Stephen. Next, at 2,600gns was Twemlows Guile, a Twemloes Dynamite daughter bought by Hollyash from the Forrester family, Whitchurch. Sold with the bull calf Hollyash Nico, which is by Emslies Galileo, it was snapped up by T.D. Pearson, Hereford. 4 cows and heifers served and/or suckling, £2,441.25; 3 maiden heifers, £1,277.50.